A dental implant is a titanium post that is placed in your jaw to support a replacement tooth. 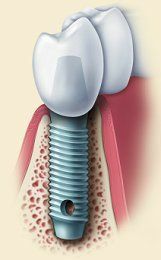 Dental implants are titanium posts that are placed into your jaw to function as replacement roots for missing teeth. They are topped by dental restorations such as crowns, bridges or full-arch dentures to become fully functional replacement teeth. 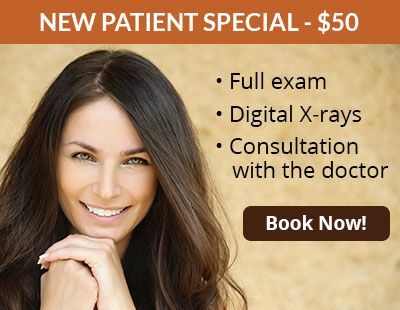 Dental implants are the most durable, long-lasting and lifelike form of tooth replacement, and our doctors always recommend dental implants as the best replacement choice for our patients who are eligible to receive them. 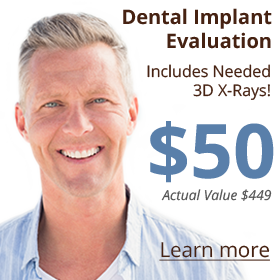 Dental implants have distinct benefits and advantages, making them the superior solution for tooth replacement. Implant-supported teeth have almost the same biting and chewing power as natural teeth. Implant-supported teeth do not require grinding down and weakening adjacent teeth, as is necessary when placing a dental bridge. Dental implants—and the restorations they support—look, feel and function just like real teeth. Patients can rarely tell the difference between a tooth supported by an implant and a natural tooth. 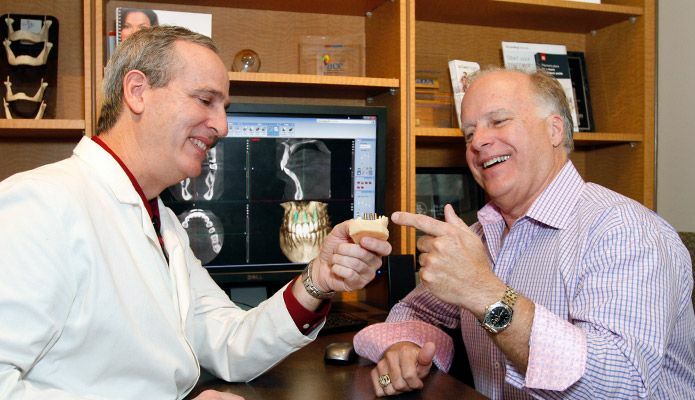 Dental implants prevent bone loss that normally occurs underneath missing teeth. This helps maintain the size and shape of your jaw. 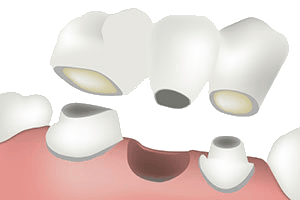 Implant-supported crowns keep the adjacent teeth stably in their position, thus preventing them from shifting into the gap and causing problems with your bite. Implant-supported dentures are held securely in place, require no adhesives and provide significantly enhanced chewing power. There is often no need for a false palate that inhibits your sense of taste, and the chewing pressure placed in the implants helps preserve the bone in your jaw. The adjacent teeth need to be ground down to attach a dental bridge. Dental bridges have long been used to replace missing teeth, but they have definite disadvantages. For example, the teeth on each side of the missing tooth have to be ground down so the bridge can be placed onto them. This weakens those teeth and can lead to decay, fracture and other complications over time. Additionally, the average lifespan of a bridge, per a study published by the American Dental Association, is only 10.1 years. Another disadvantage to bridges is they do not prevent bone loss from occurring under the missing tooth. Dental implants, however, do not require any grinding down of natural teeth. They also provide the biting and chewing pressure needed to preserve the bone volume around your teeth, which traditional bridges cannot do. And dental implants, if cared for properly, can last a lifetime. 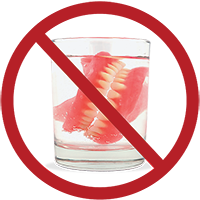 Traditional dentures were the only option for replacing all your teeth before dental implants were used to support full-arch restorations. Traditional dentures have greatly improved over time, but they still provide only 25% of the chewing power of natural teeth, at best. They also need adhesives to be secured in your mouth, and can slip out of place or make clicking noises while you are eating or talking. 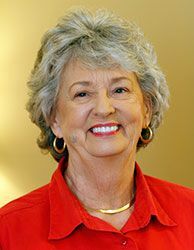 Bone loss occurs when teeth are missing, and dentures accelerate this bone loss process, causing eventual collapse of the facial muscles. This causes the chin to move toward the nose, the lips to become thinner and the cheeks to sink inward, causing deep wrinkles and folds. The continuous loss of bone also causes the dentures to constantly lose their fit, resulting in sores and painful chewing. When implants are used to support dentures, the chewing pressure on the dentures transmits through the implants into the jawbone, preserving the jaw’s volume and density. Your replacement teeth will not move around or slip. There is often no need for a false palate on the upper denture that inhibits your sense of taste, and your chewing power can go as high as four times that of a traditional denture. Learn more about the benefits of implant-supported dentures here.